Boiler: Hewitt & Kellitt Ltd, Bradford. 1919: Launched by Lea Shipbuilding & Repairing Co, Canning Town (Yd.No.859) (“Admiralty drifter”) for The Admiralty as WIRLBLAST. 31.7.1920: Completed as a fishing vessel. 9.12.1920: Transferred to The Fishery Board for Scotland, Edinburgh for disposal. Laid up at Dundee. 1921: Sold under HM Treasury mortgage agreement (Disposal of Admiralty Drifters to Ex-service Fishermen) to David Watson, Cellardyke (Thomas Cunningham, Anstruther, manager) for £6,400 with no deposit paid, later reduced to £4,800; less £500 for defects found. 1921: Registered at Kirkcaldy as STELLA AURORAE (KY45). Official No.131875. 22.8.1922: Outstanding payments £716.13.4d capital, £396.14.4d interest. 28.1.1925: Sold to Bloomfield’s Ltd, Gt. Yarmouth & J. Watt, Fraserburgh (Neil Mackay, Caister-on-Sea, manager). Kirkcaldy registry closed. Registered at Fraserburgh (FR54). 11.1929: Sold to Henry H. Catchpole, Lowestoft (managing owner). 26.11.1929: Registered at Lowestoft (LT116). 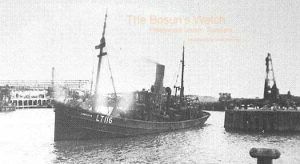 9.12.1929: Registered at Lowestoft as ABIDING FRIEND (LT116) (BoT Minute M/R.G.1526/29). 7.3.1938: Sold to Arthur C. Mitchell (42/64), Milford Haven & George Mitchell (22/64), Lowestoft (Arthur C. Mitchell, manager). 19.4.1938: Registered at Lowestoft as JACKEVE (LT116) (BoT Minute M/R.G.1149/38). 23.11.1939: Requisitioned for war service as a minesweeping drifter (P.No.FY958) (Hire rate £32.16.0d/month). .1943: Employed on miscellaneous naval duties. 4.4.1944: Sold to Haven Trawlers Ltd, Milford Haven (Robert Lewis, Milford Haven, manager). 7.4.1946: Sold to W. H. Kerr Ltd, Milford Haven. 17.4.1946: Sold to Hamilton Fishing Co Ltd, Milford Haven (W. H. Kerr Ltd, managers). 1950s: Seasonal white fish trawling from Fleetwood. 1951: 17 landings at Lowestoft, fished from Fleetwood between March and July. 1952: 28 landings at Lowestoft, fished from Fleetwood between June and August including 9 landings from broken trips with engine and winch problems. 1953: No landings in Lowestoft, fished from Fleetwood, Padstow and Milford. 1954: 9 landings at Lowestoft, fished for 3 months from Fleetwood, 7 landings there and 3 broken trips with engine problems. 1954: Sold to BISCO and allocated to Thos W. Ward Ltd, Sheffield for breaking up at Castle Pill, Milford Haven. 15/10/2013: Page published. 5 updates since then. This entry was posted in Drifter/Trawler, Seasonal Visitors, Steam Trawlers and tagged Admiralty Drifter, No Fleetwood owners, Seasonal Visitors on October 15, 2013 by Fred Smith.